I think it’s safe to say that cats have dominated this cyberworld we occupy. With the rise of cat-centric social networking sites like Catster and Catmoji, us cat ladies (and fellas) are officially out of the closet, and clearly we’re not alone. Traditional pet enthusiasts (aka dog owners) are struggling to figure out how cats could have beaten out man’s best friend for the spotlight on the largest global stage that has ever existed. Instead of fighting this adorable phenomenon, we should all just sit back, and just enjoy it. But for the folks out there who are still puzzled as to how this could have possibly happened, here are a few reasons why cats will always win on the Internet. For those of us living the 9-5-work week, it’s hard not to become envious of cats sometimes. When I think about it, my cat pretty much has my dream life. She basically lives to take naps, do things that are unintentionally adorable, and eat organic food that someone else buys for her. She cat pretty much do no wrong in my eyes. It’s true. Cats share many of the same features as human babies: large, wide set eyes, a flattened nose and that indescribable “I’m helpless” look. Because human infants are so helpless when they’re born, we evolved to think babies are adorable, so we will nurture them until they can fend for themselves. Whatever triggers our desire to feel compassion toward infants is also activated when we see a kitty. We all want to share the things that are important to us with the people we love. If you’re really into yoga, you try to drag your friends to class with you. If you’re in love, you want your entire social circle to meet that special someone. When you get a new car, you want to take your friends out for a spin. But when you get a new kitten . . . you take pictures of it being cute and upload them to Instagram. Basically, the Internet’s love of cats has allowed cat lovers everywhere to shatter the stereotype of the lonely, reclusive cat person. Cat loving online communities like Buzzfeed, Cheezburger, and Imgur have allowed us to craft a new narrative where our cats are the social stars of the show. We can finally share something we love with the rest of the world. The Internet allows people to become stars from the comfort of their own homes! Fortunately, this privilege has also been extended to their feline counterparts. At a time when cat worship and hipster cynicism were at an all-time high in the digital world, along came a cat that perfectly combined these two qualities — Grumpy Cat! Her real name is Tardar Sauce and she became an overnight Internet sensation in September of 2012 (for obvious reasons). Grumpy Cat now enjoys her own cult following. Her last public appearance was at South by Southwest where fans waited in line for over 5 hours just to take a picture with her! First of all, LOOK AT THAT FACE. Lil Bub has been declared as “one of nature’s happiest accidents.” Good Morning America has even dubbed her “the cutest cat in the world.” She recently starred in a documentary called Lil Bub and Friends. It just won best feature film at the online Tribeca Film Festival. Let’s all say it together, “Awwww” Just when you thought that an Internet-famous cat had to have an odd/cute looking face, Snoopy comes in and shows us all that you can be a winner just from looks alone. Snoopy quickly became a superstar on Instagram with her super cute face. 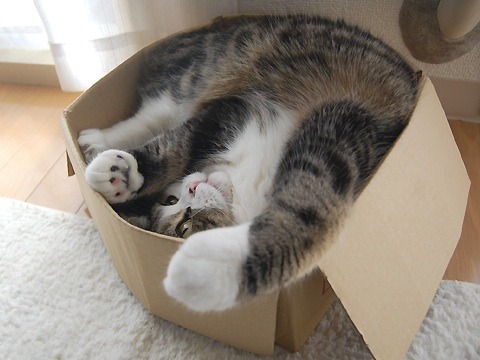 Maru lives in Japan, but is well-known throughout the whole world for hanging out in boxes and being really cute. Her videos on YouTube have been viewed over 158 million times, and her YouTube channel is one of the most popular in Japan. Aside from being a cyber-star, Maru has been featured in several books and movies, illustrating that cats can be successful across all media platforms. Oh.My.God. Colonel Meow’s popularity quickly dispels any theories that famous Internet cats have to be cute. I mean he IS cute, but also kind of terrifying. This Seattle based cat has over 35,000 fans on Facebook, and avid YouTube subscribers. It’s hard to believe that Colonel Meow is all-cat and not secretly part bear, but he is! According to his owner, Colonel likes to sleep, is afraid of birds and wants to dominate the world. These famous kitties are living proof that Internet audiences are hungry for cat-content. We’re standing by, ready and willing to embrace cats of all shapes, sizes, colors, and temperaments into our digital lives. Moral of the story: Dogs may rule the streets, but cyberspace belongs to the cats. Meow.